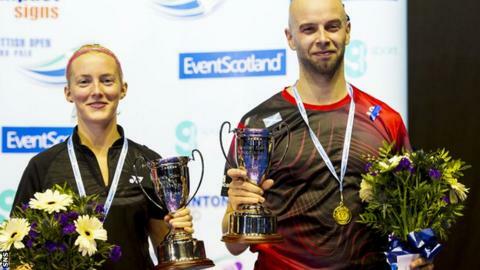 Robert Blair and Imogen Bankier successfully defended their Scottish Open Grand Prix title with victory over Niclas Nohr and Sara Thygesen. Scotland's Commonwealth Games bronze medallists and number one seeds beat the Danish pair 21-18 21-14. English duo Heather Oliver and Lauren Smith lost out to Gabriela Stoeva and Stefani Stoeva in the women's doubles final at Glasgow's Emirates Arena. The number one seeds from Bulgaria triumphed 21-7 21-15. Blair and Bankier, who were top seeds and had won both their previous meetings with the Danes, won a tight first game before taking control in the second. It gave Blair his fifth Scottish Open mixed title - he has also won the men's doubles - and his third with Bankier, who claimed her fourth mixed title. Blair said: "It is fantastic when you have a win like this and friends and family are able to watch you and we have had some success in this arena." The experienced pairing will hope to build on their success when they and singles player Kirsty Gilmour head for the Axiata Cup in Jakarta and Kuala Lumpur on Monday. But Bankier admitted: "The home support makes all the difference. The home crowd really lifts us." Japan's Sayaka Sato, who defeated Gilmour in the semi-finals, beat Spain's Beatriz Corrales 21-18 21-9 to take the women's singles title. Ville Lang, who was the 2006 men's champion before it became a Grand Prix event, saved four match points in the second game before fighting back to defeat Taipei 19-year-old Tzu Wei Wang 17-21 22-20 21-16. The Finn said: "At 20-16 down in the second, I acted like I had given up. I've done that so many times against opponents and they let their guard down. "I love playing here and I love to entertain the crowd. I am very happy because this is my first Grand Prix victory ever and by far the biggest victory I have ever had." In the men's doubles final, Danish pair Mathias Christiansen and David Daugaard defeated Germany's Raphael Beck and Andreas Heinz 21-13 21-17.